Journal: We were woken up early (4:30am) by a phone call from Keith and I decided to stay up and finish the October financials. Alicia wanted to go to school on the busand I took her down to the bus stop at 7:30am and this delayed my departure. Then it began raining and I postponed departure till 9:00am, later than I would have liked. Barb clearly thought I was crazy and was worried about my safety. It was still spitting with rain as I left and as soon as I began riding I realised my heels were going to hit the pannier. I stopped and adjusted them in Copa and then tackled "the hill". It was OK and I stopped at the top and took off my Goretex. Progress was steady to Gosford where I decided to go up the Pacific Highway hill instead of tackling Dog Trap Road. I made it up without stopping and continued to Mangrove Mountain. It took longer than I expected and I stopped for a snack at 11:30am. The weather was still very threatening but it hadn't rained again. I then continued on to Wisemans Ferry which again took longer than expected. It was, however, a pleasant ride and I enjoyed looking down on the Hawkesbury River where I had been paddling only a week earlier in the Hawkesbury Classic. I crossed the ferry and found a take-out place in town where I had fish and chips sitting at a table outside. I wasn't sure whether I could make Kurrajong (and the next shop) by nightfall so had a look in a small supermarket to see whether they had any bread rolls, but they didn't. I set off along the River Road towards Lower Portland Ferry. It was a lovely ride with no big hills and lots of views over the river and farms. After the ferry I began climbing towards the Blue Mountains. It was steady up to Blaxlands Ridge and then relatively flat along the Ridge to Kurrajong., firstly through bush and then hobby farms. I got to Kurrajong at 6:30pm and stopped for an ice-cream and some groceries. 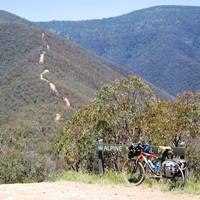 I hoped to get past Kurrajong Heights before stopping for the night so that I had the biggest climb behind me. I began the climb and ended up walking much of the way. I thought of stopping in a motel if I could find one as it got darker. I put on my lights and continued on looking for somewhere to pitch my tent, but it was hard because it was now dark. In the end I stopped in a lay-by right next to the road and set up camp in the dark at 8:30pm. I had a quick dinner of chips, bread and peanut butter, and chocolate, and was in bed by 10:00pm.